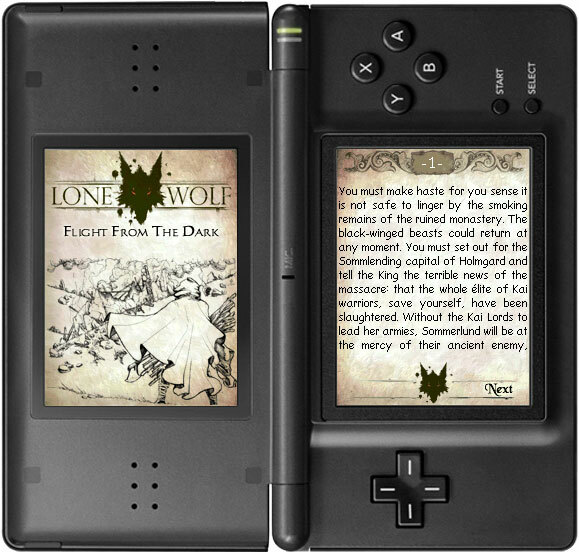 Home » [DS] Reviews » [DS] Lone wolf: Flight From The Dark Homebrew impressions. Developed by avid "create your own adventure" enthusiasts. 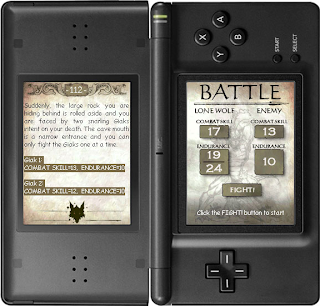 The game is a DS adaption of a book by the same name, while reading the book you would have a score card, paper and dice, you would progress through the book, choose your paths, and eventually battle monsters and get stronger. These kind of books were popular in the 80's since computers weren't strong enough to have epic games. It's hard to keep track in these kind of books, so Project Aon team have faithfully recreated not 1 but 2 Lone wolf books onto DS. 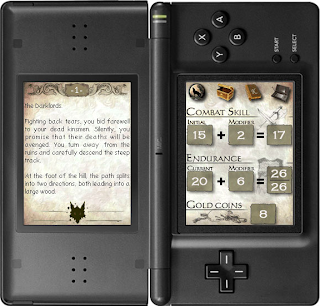 The original text's are all left in tact but ALL of the play base game parts are handled by the DS, it will keep track of battles, stats, skills so you can truly immerse yourself in the story. The Artwork is beautiful, and the musical score is gripping. Quality home brew like this is tough to come by. I recommend every single Slot-1 device owner to at least try it. And if you do end up loving it then they've got you covered, since the second book in the lone wolf series is also converted to the DS. Not to mention this is completly legal, The author of those books gave Aon Team permission to use his books. This game is a MUST HAVE, if not only to add some depth to your DS rom collection.